Leon Sulman 1946 Wingspan 49"
Distinctive polyhedral pylon model. The fuselage is made from sheet balsa which is crossed making for a rapid build. Lightening holes in the fuselage sheet add to the distinctive looks. 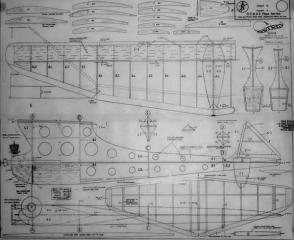 The plan is nicely detailed and shows ribs and formers.